You can’t have a football game party without chicken wings. It has become an American tradition! We have the perfect recipe for you. Easy to make and easy to eat! The spicy, but not too hot flavor is a favorite among adults and children. 2. 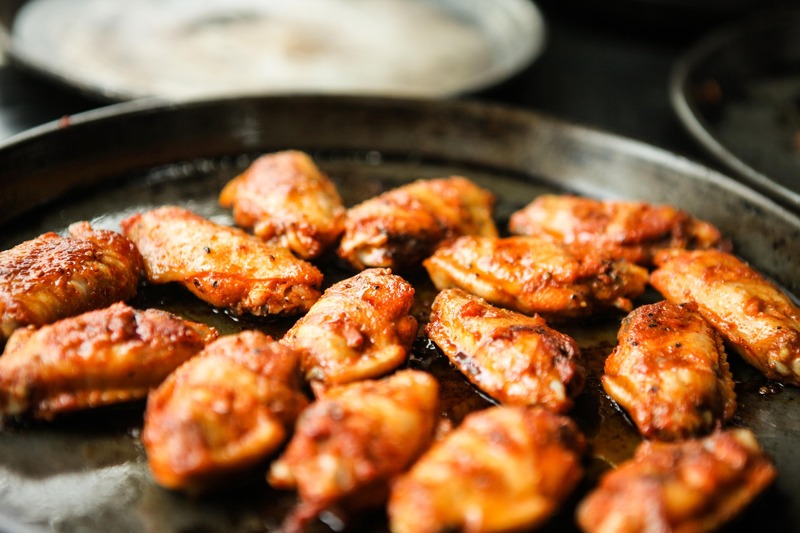 Place wings on a parchment paper covered baking pan. 3. Bake in the oven for 30 minutes, or until cooked through and crispy. While they are cooking, start the sauce. 4. Combine hot sauce, coconut oil, vinegar, paprika, cayenne, black pepper, and garlic powder in a medium saucepan. 5. Set over low heat, mixing until oil is completely melted and combined; simmer for 5 minutes and remove from heat. 6. When wings are baked, dip in sauce to coat well, then shake off excess and return coated wings to baking sheet. 7. Reduce oven temperature to 250 degrees F, and give wings another 15 minutes to bake. Toss wings in remaining sauce after you remove from oven. Serve with a garnish of chives and parsley, if using.